This one kind of left me wondering on why we were reviewing this one also seeing how it has a nice number of clones of itself for other clans (namely Lien for Royal Paladins and Shout for Nova Grapplers off the top of my head). With that being said, this skill is pretty decent as it helps you get the cards that you need by ditching random useless cards like dead Draw Triggers or an abundance of Grade 3’s that are stuck in your hand. In this case, people would probably use this to drop Monica/Carbuncles, Gatling Claw Dragons or other random cards to try and get to their Dragonic Overlord The Ends faster. However, most Kagero players already have a tight amount of space left to use this as they are already mainly using Bahr, Heatnail Salamander, Barri, Kimnara and even Aermo. If anything, some people run Gojo over Aermo and vice versa. In short, this card is very nice, but you only need 2-3 copies tops if you even are considering using him at all. Gojo is the Kagero clone of Lake Maiden Lien, Nostrum Witch Arianrhod, etc. Turn it sideways, giving up your ability to attack or boost with it for the turn, discard a card, and draw a card. 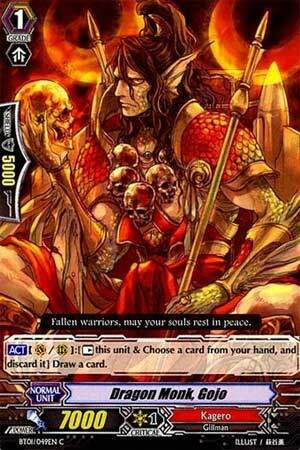 I highly recommend the use of cards like Gojo. They can help stabilize early hands that can be full of junk, and add some draw power, potentially avoiding getting grade locked. The best use of Gojo is as a first turn ride; you can’t attack anyway, so you might as well dig a little deeper into the deck. Outside of the early game, Gojo is a solid 7k booster, boosting Berserk and Bellicosity Dragons to 16k, Dragonic Overlords to 18k, enabling them to threaten cross ridden vanguards. If the worst should happen and you do get grade locked, Gojo is the most reliable way to get out of it as soon as possible. There are other ways to draw extra cards (ie. Aermo) but they are conditional on your attack hitting. A wise opponent will recognize that and guard appropriately, making Gojo the best option. Rating: 3/5 – Great for first turn and getting out of grade locks, but only okay elseware.